As executive director of the Washington Food Coalition, Julie Washburn provides a forum for nonprofits to share ideas about how to end hunger. As the U.S. continues to emerge from economic recession, more people than ever need help from service providers, crisis help centers, and food banks. At the same time, the resources for those agencies have been shrinking with fewer donors and deep cuts in government funding. But one organization here in Washington isn’t just weathering the current economic climate. Under Executive Director Julie Bodine Washburn ’06, the Washington Food Coalition is reaching and helping more people than ever. 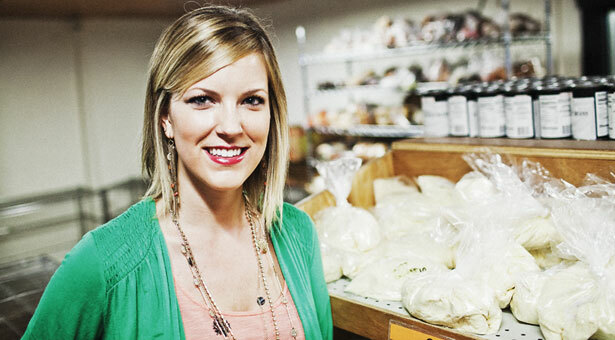 Named one of “40 Under 40” leaders in 2010 by Tacoma’s Business Examiner, Julie is also Seattle Pacific University’s 2012 Young Alumna of the Year. The Coalition Julie leads is an umbrella nonprofit that helps state food banks and anti-hunger organizations work collectively to better serve communities from Walla Walla to Bellingham. Those nonprofits and local agencies have never faced a more challenging time, says Julie, who took over in June 2010. And while the need goes up, nonprofit budgets are tight. “It’s not as if they all have all sorts of resources and donations going up — those are being cut back,” Julie says. But by helping member nonprofits share ideas and better work together, the Coalition is growing rather than shrinking under Julie’s leadership. She also brings business-minded efficiency to helping the state’s anti-hunger organizations better share overhead costs, allowing them to put more money into helping those in need. Julie majored in sociology, adding minors in history and business at Seattle Pacific. As part of a business class, Washburn and classmate Kelsey Diller ’08 created Motivo Coffee, an online coffee seller that partnered with nonprofits to use their supporters’ caffeine addiction as a fundraising tool. They kept building the company after graduation. “Hopefully she’s the first of a whole bunch of new young leaders that are bringing business ideas to nonprofits,” he says.